Yosakoi Festival (スーパーよさこい) is one of the most popular dance festival in Tokyo. It takes place at Harajuku and Omotesando. Over 100 Yosakoi Dance teams and over 10,000 dancers show their original Yosakoi Dances with unique costumes. Yosakoi Festival is hold in the end of August. 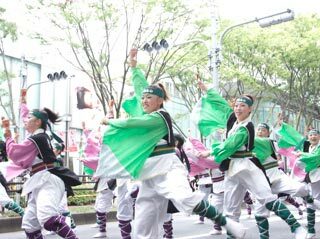 It is chosen one of 10 best Japanese Matsuri, and one of the three major dance festival in Tokyo, as well as Koenji Awaodori and Asakusa Samba Carnival. They are the finale of the end of Japanese Sumer vacation. There is no parking. Omotesando Street will be closed for this carnival, and you can have a seat on the side of the street. There are several stages around Harajuku Station. Yosakoi is the Tosa (Kochi prefecture) dialect, and it meands "visit at night." Yosakoi dance was born in 1954 at Kochi prefecture after WWII. It started for make people active and happy. Yosakoi Dance is based on only this rule. As long as use the phrase of the song of "Yosakoi Naruko Odori." So, all dance teams feel to create their own style of Dance and music. So, Yosakoi Dance is free style dance with unique costume. So, some dance team use traditional Japanese dance, and some people use break dance, hip hop, or even samba dance. One of another specially thing is Yosako Dance use Naruko. Naruko is the simple Japanese instrument, a bird clapper. In Yosakoi Festival at Harajuku, the parade float leads the dancers. They play music and the leader of the team give the dancers call out and lead the rhythm. Each dance team has their own theme every year, they create dance, music and costume based on that.